FWD is pleased to announce its sponsorship of the “FWD North Pole Marathon” – which will be held on 9th April 2019 – for the third time. 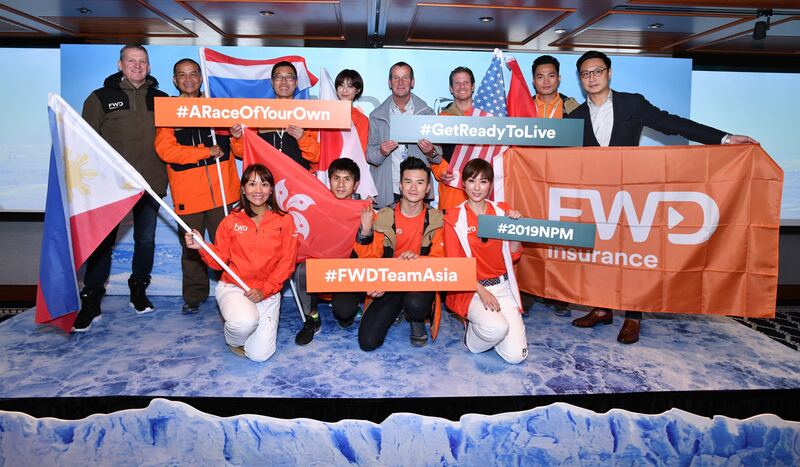 As a title sponsor for the marathon, FWD will also support 10 passionate runners from across Asia to embrace the challenge at the extreme 89-degree latitude North. The FWD Team Asia consists of 10 runners from across Asia, including Annie Liu (Hong Kong actress), Andy Leong (singer and former member of the band C All-Star, and Tsui Chi Kin (accomplished full marathon runner) from Hong Kong; Joyette Jopson from the Philippines (an FWD Financial Wealth Planner), Ittiphol “Pok” Samutthong from Thailand (a fitness show host from Thai PBS) and Phan Thanh Nhien from Vietnam (an expert in adventurous tracking safety and amongst the first Vietnamese to conquer Mt. Everest). Additionally, flying the FWD Team Asia flag from Japan will be Misaki Izuoki, Joe Vlog and Hideaki Oono; and FWD’s Managing Director and Group COO, Rob Schimek, who is based in Singapore.